You don't always need complex machines or special facilities to get a good workout. You can practice speed and strength training just by going up and down your stairs at home. Keep reading to find out more. It’s a fact: climbing stairs is quite a workout. What’s interesting is knowing how to add stair climbing to aerobic routines and daily exercise programs for speed and strength training. Advanced speed and strength training using stairs will make use of the same components of intense sports training. As such, you can enjoy many benefits in a few minutes’ time and without any investment. 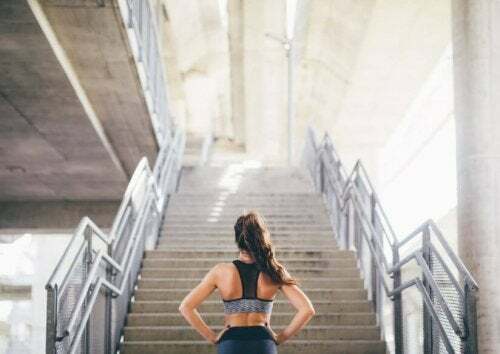 The strength you’ll gain from speed and strength training using stairs is similar to cycling and running. With certain advanced training techniques, a routine activity such as stair climbing can become an intense exercise. Speed and strength training using stairs is a form of plyometrics. This means that your muscles exert force in short intervals of time as they flex and extend in a fast or “explosive” way. The main benefit of this exercise is that it strengthens your main movement muscles. In other words, your quadriceps, glutes, and calves. Further, it boosts your metabolism, meaning it uses a lot of calories and burns fat. Due to its plyometric quality, this exercise is great not only for cyclists and runners but also for athletes who jump in their discipline. It should be added to anyone’s routine that requires strength, speed, and power in their legs. 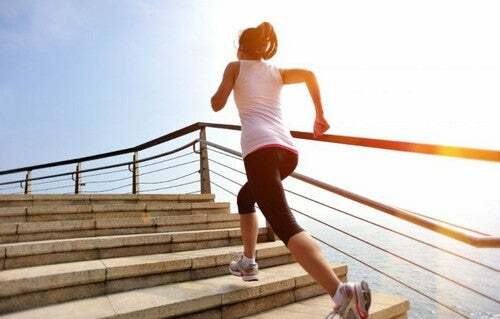 In fact, high-intensity training on stairs is comparable to mountain running or with changing gradients. Indeed, over time, running uphill offers incredible quadricep strength. To prepare for a competition, those who live in the plains, as well as those in the mountains, have to adapt what they have at hand. Climbing up stairs will result in concentric contractions while climbing down results in eccentric ones. Gains in cardiovascular fitness are parallel to the muscular strength you gain. Keep in mind that warming up is the key to avoiding injury. 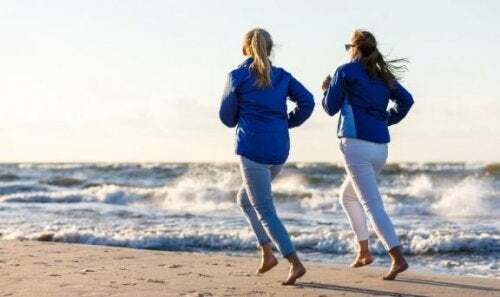 Before any kind of activity, about 10 minutes of jogging or brisk walking is often enough. Next, we’ll go over some tips for climbing up and down stairs. The basic way to train is to climb the steps one by one. Any climber or mountaineer will appreciate how similar climbing steps is to climbing a mountain. At the same time, the step-by-step ascent resembles the way a squat activates muscles. However, it’s more enjoyable to perform the movement on the stairs. What’s more, you can try out dozens of variations in addition to the basic one-by-one approach. For starters, you can go faster. Of course, you should pick up the pace gradually. Also, you can jump; in other words, you can climb more than one step at a time. Of course, the resistance from the stairs will become more intense with each jump. Those who like intense plyometrics can climb the stairs by jumping, as long as they do so once they’ve gained enough experience. Use the descent as a rest interval. Always look straight ahead; looking at your feet wastes your energy. You can go up and down completely up to 10 times for a total time of 30 minutes at the most. When you go down a flight of stairs, you target your muscles as well. In other words, with each step, you extend the muscles you worked when you went up. Indeed, your muscles flex and contract. As such, you target the front part just like on a mountain slope or in downhill running. 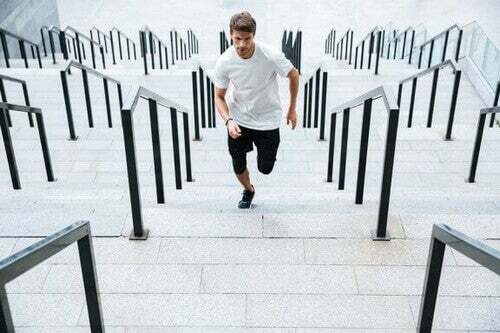 Finally, make sure you take some obvious precautions when performing speed and strength training using stairs. Due to the possibility of falls or injuries, you should up the complexity of the training slowly. You can opt for a stadium, stairs in a park, or any place with outdoor stairs. Of course, as with any aerobic exercise, make sure you keep hydrated before, during, and after your workout. Among other reasons, it will give you the endurance you need for your daily exercise routines. How to Start Getting the Results You Want!